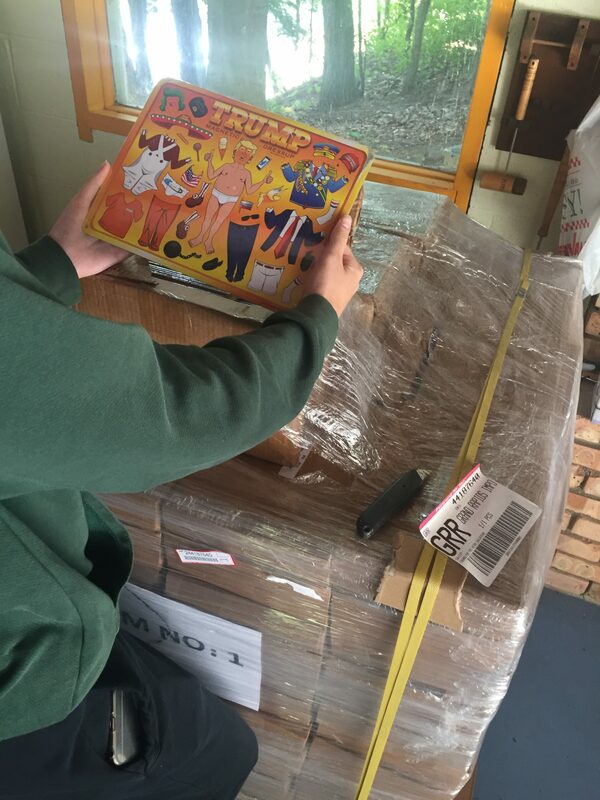 The shipment of Trump magnets arrived today and they look amazing! Good Lord, I can’t believe they’ve finally arrived. I’m sure it appears as if I’ve stopped doing anything here at normalbob.com, but rest assured the only reason for the lag is to rest up before my latest project hits the market. And that’s today. 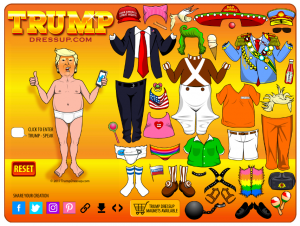 I give to you Trump Magnetic Dressup. Do you have any idea what it’s like to have to wait for three months while your time-sensitive idea is being produced on the other side of the world? Watching the news not knowing if they’ll be rendered completely invalid or a huge marketing success by the time they get here? Well, it seems that day of reckoning is finally here, and it looks like everything’s worked out okay. So what’s sure to be the most mainstream project I’ve ever embarked upon, while at the same time probably losing me the maximum number of friends & fans, I have to tell you both the site and the magnetic version look amazing. The online version of the game goes above & beyond the playability of any dressup I’ve produced before thanks to the partner I’m working on this with. I’m so pleased to say it can be played on your computer in all browsers, tablets, smartphones, etc. so feel free to share it with your friends on social media. 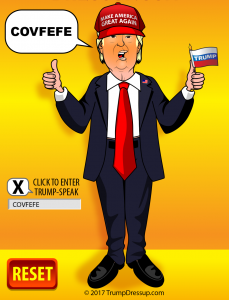 There’s also the additional Trump-speak feature which allows you to include Trump’s latest Tweet or anything you want him to say in with your dressup creation. If you’re wondering why I have them for sale in both my regular Jesus Dressup store while also available at a Shopify connected to Trumpdressup.com, it’s because, like I said, I’m not pursuing this venture alone. I have a business partner to help with marketing, programming, finances and other things to make this a complete venture with maximum profitability. The only difference in these two stores is the option to include Jesus Dressup magnets in with your Magnetic Trump Dressup order from my personal store. The cost to you and the amount that goes in my pocket from a purchase is the same. I truly have no idea what to expect after this moment so I just suggest you buy your set soon because their days of availability are probably numbered. 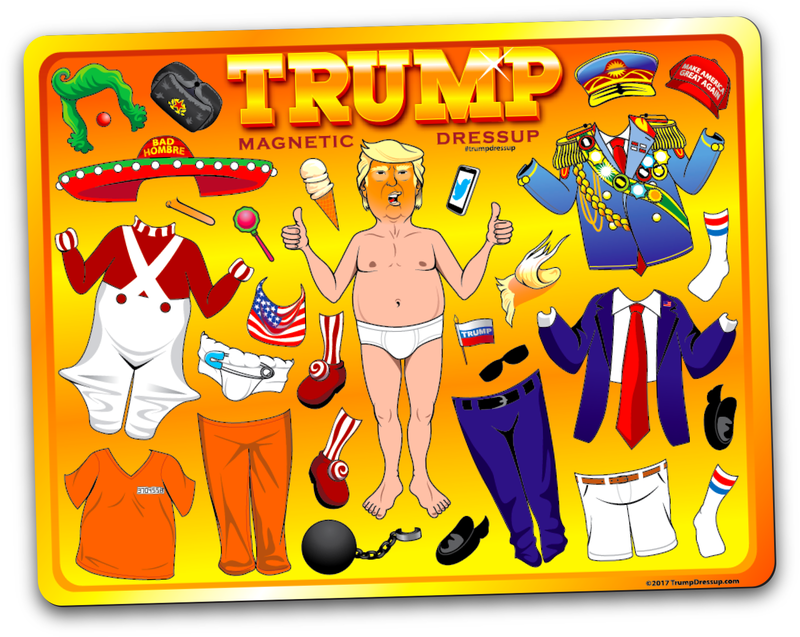 If you are a store who would like to have Magnetic Trump Dressup on your shelves, contact me and I’ll be happy to send you wholesale prices & availability. And I suppose now’s as good a time as any to say thank you to my folks for letting me take residence in their home while I profit off mocking both their saviour and their president.